Answer: Yes, you can find the wall-mount mailboxes with nickle-plated plaques on this page by clicking the link. Question: Is the personalized address plaque sold separately? Answer: Yes, personalized address plaques are available as an option and are sold separately. Thank you. 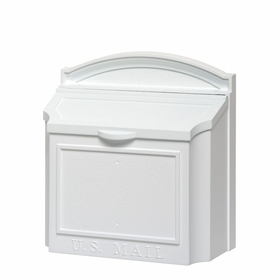 Question: What are the wall mailboxes made of? Are they rustproof? Answer: It is made from recycled die cast, rust-free aluminum. 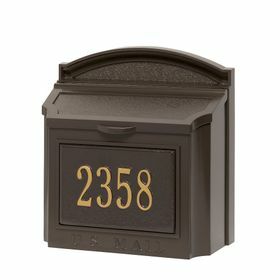 Question: Can I order a plaque insert for my wall-mount mailbox? I have the wall-mount Whitehall mailbox in black. I want to add the eagle inset to it. 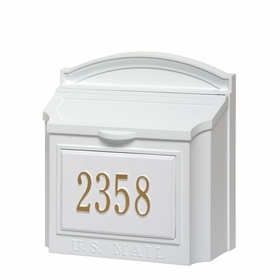 Answer: Whitehall Products does not offer an eagle plaque insert for their wall mount mailbox. Question: When ordering mailbox with one line address, how long does it take before delivery? Answer: It still takes 3 to 4 weeks for one line of text. Question: Is there a newspaper hanger available? Can I eliminate the lock part and just have it easy access? Answer: The locking insert is "removeable." There is no newspaper option for this mailbox. Answer: You may contact Whitehall directly for paint needs. Also you may be under warranty.